The Mystical Warriors of the Ring indie toy line was once again represented this past weekend at C2E2 in Chicago, marking its third year in a row at the convention. You might remember that it debuted there in 2013, when its first ever sets were sold in packs that included resin figures and a wrestling ring. There's been nonstop activity with MWOTR since then, including multiple resin and PVC figure releases. 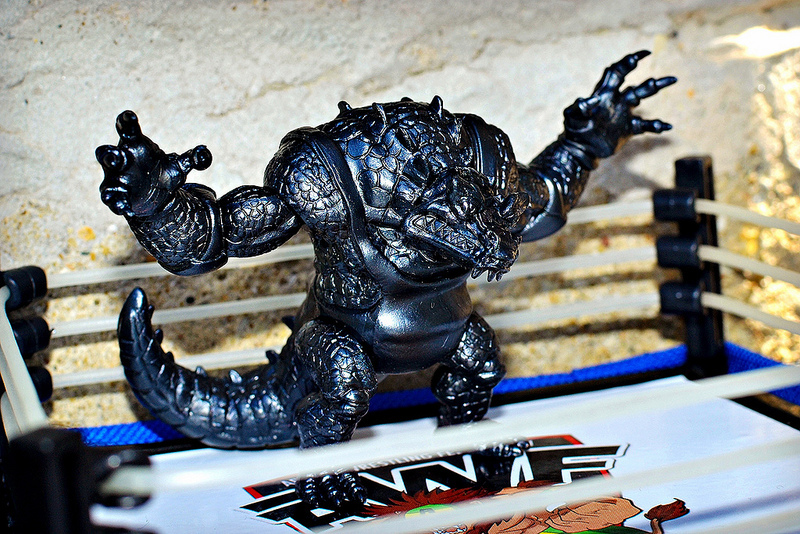 The latest offering, launched at C2E2, consists of three new Series 2 figures plus the popular Goliath figure, all in very attractive metallic black PVC! First available in very limited quantities late last year as brown test-shot figures, the Series 2 three-pack has finally seen full release in the metallic black color. The set consists of Ulric Wolfrom, Yvonne Wolfrom and Leo Corazon/Generations Lion. They range from around 1.5 to a little under 2 inches, with Yvonne being the tallest. As per usual with MWOTR releases, the sculpts pack in a lot of detail for their small size. Joining the trio is a new Evolutions Goliath, which first came out this January in metallic green. Since the character is one of the "giants' of the series, this figure is much larger and bulkier than the others. It's about 2 inches tall, but measures 3.5" across when his arms are positioned out. As I detailed when I reviewed the metallic green version, one of the things that makes this figure so awesome is that it makes use of the Glyos system, so it actually consists of multiple pieces that can be taken apart and put back together. This makes for many points of articulation and tons of different ways you can pose him. Goliath looks very sharp in this color. I love the way it allows for the light to catch the many different textures and details of the sculpt. At C2E2 all four figures were offered in a bundle for $15, with the option to purchase additional Goliaths on top of that for $6. At the time of writing this, leftover stock from the show is still available to order online, and is being sold in the same way it was at the show. So, you can purchase a bundle including one Series 2 three-pack plus one Goliath for $15, or one Series 2 three-pack plus two Goliaths for $21. Head over to the MWOTR shop to pick some up.